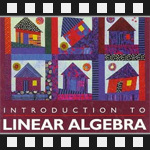 This is the fourth post in an article series about MIT's Linear Algebra course. In this post I will review lecture four on factorizing a matrix A into a product of a lower-triangular matrix L and an upper-triangular matrix U, or in other words A=LU. The lecture also shows how to find the inverse of matrix product A·B, how to find the inverse of transposed matrix AT, and introduces permutation matrices. Lecture four starts with a small review of inverse matrices. Remember from previous lecture that the inverse of matrix A is matrix A-1 such that multiplying them together A·A-1 produces the identity matrix I. Another key fact to remember is that matrix multiplication is associative (can change parenthesis) and that for square matrices the right-inverse is also the left-inverse A·A-1 = A-1·A = I.
Lecture then continues with finding the inverse of matrix product A·B. The answer is found by reasoning what should we multiply A·B to get the identity matrix. Let's try B-1·A-1. If this is the inverse of A·B, then multiplying it with A·B from the left and right sides should produce the identity matrix I. Let's test this. From the right side: (A·B)·(B-1·A-1). Since we can rearrange parenthesis, this is the same as A·(B·B-1)·A-1. But B·B-1 is identity, therefore A·(B·B-1)·A-1 = A·I·A-1 = A·A-1 = I. Seems good so far. Now the left side: (B-1·A-1)·(A·B). We rearrange parenthesis again, B-1·(A-1·A)·B and just like in the previous example, A-1·A is identity and B-1·I·B is B-1·B = I. We have found the inverse of (A·B). It's (B-1·A-1). 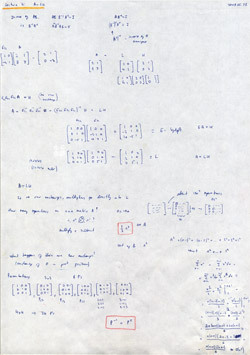 Next, while we're at it, the lecture continues with finding the inverse of transposed matrix AT. It's found by reasoning again. Let's first look at the equation A·A-1 = I. We can transpose both sides of this equation and it will still hold. If we transpose the right side, we get the same identity matrix I, because IT=I. But what about the left-hand side? Transposing the left-hand side we get (A·A-1)T = (A-1)T·AT. Now left-hand side is still equal to right-hand side, therefore (A-1)T·AT = I. But from this equation it's instantly obvious that the inverse of AT is (A-1)T.
We can therefore note and remember that (AT)-1 = (A-1)T.
Finally the lecture moves on to today's key topic of A=LU decomposition. As usual, the topic is introduced by an example. And let's try to find the elementary matrix E21 that will eliminate the element at row 2, column 1. Multiplying the first row by 4 and subtracting it from the second row will produce a zero at 2, 1. But look at the right-hand side. It's the upper-triangular matrix U (all elements below the diagonal are 0) that we were looking for! Now if we multiply both sides by the inverse of E21, we get (E21)-1·E21·A = (E21)-1·U. But (E21)-1·E21 is identity, therefore A = (E21)-1·U. From this equation it's instantly obvious that the lower-triangular matrix L is nothing else but (E21)-1! The algorithm for finding matrices L and U should now be clear. First do the elimination to find matrix U, then invert the product of elimination matrices used for finding U to find L. Actually it's even easier, you don't even need to keep elimination matrices E, or find their inverse. You can just keep the multipliers used in each elimination step. Please see the video to find out how it works. Since we sometimes need to do row exchanged to do elimination, the last ten minutes of lecture are spent on permutation matrices. Remember from lecture two that multiplying a matrix from the left side with a permutation matrix exchanges its rows. The inverse of P is its transpose: P-1 = PT. There are n! permutation matrices for nxn matrices. [01:20] What is the inverse of A·B? [05:20] What is the inverse of AT? [09:20] A=LU factorization for 2x2 matrices. 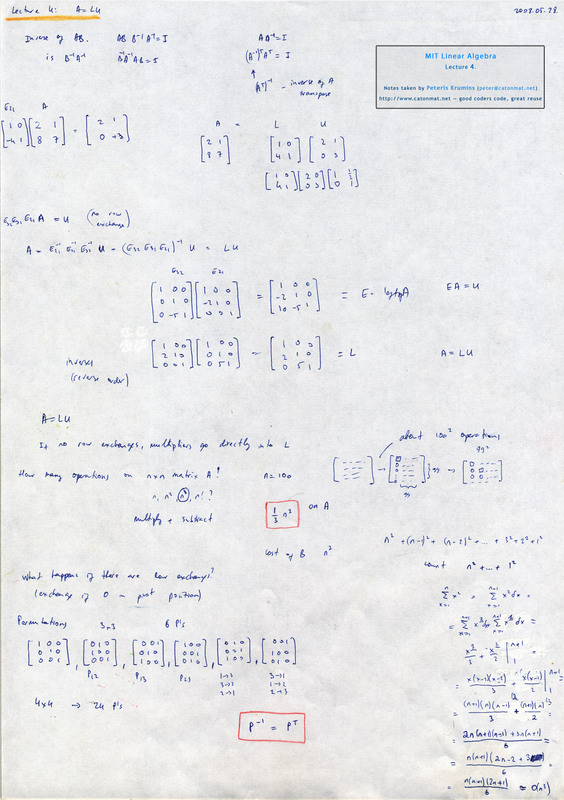 [14:50] A=LU decomposition for 3x3 matrices. [18:30] Why is finding matrix L trivial? [27:25] How many operations does elimination take? [47:20] What is the inverse of a permutation matrix? [48:20] How many P matrices for 3x3 and 4x4 matrices? My notes of linear algebra lecture 4 on the A=LU factorization. The next post is going to be about transpose matrices, symmetric matrices, vector spaces, their subspaces and column spaces of matrices.